1/2" X 12" Metal Abrasive Sanding Belts (File Belt). 180 grit. Aluminum Oxide (A/O). Closed coat, X weight Cloth backing. Sold in packs of 20. 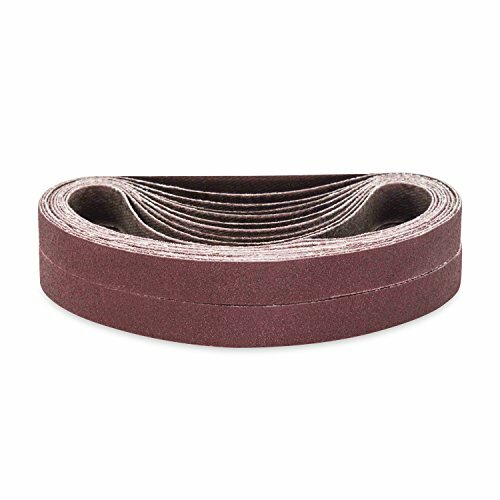 High quality and long lasting all purpose industrial abrasive sanding file belts provide an even finish on hardwood, solid surface, and non ferrous metal (Aluminum, Copper, Titanium, Nickel) when used with pneumatic and electric file belt sanders. Closed Coating provides a smooth and balanced sanding finish. Resin over resin bonding. Bi-directional tape joint. Assembled in USA. Best for: weld removal, grinding, of non ferrous metals (aluminum, titanium, brass, Bronze, copper). Also great for ferrous metal (Steel, Stainless Steel, Cast Iron, Carbon Steel. Premium material for general weld removal. Also works great as a multipurpose belt. Premium Blue Fired Aluminum Oxide Closed Coat material with grinding aid reduces heat and buildup.